Kitchens are very hardworking spaces and they see a lot of everyday use. If a home has a larger number of members, the kitchen will see even more wear and tear. This simply means when this room is being designed, care has to be taken to use materials that are hardy and long-lasting. Every home has different function needs and we at Bristol Construction take a lot of care to provide our customers with tailor-made solutions that meet their requirements perfectly. Laminate- This is essentially sheeting that is glued to particleboard substrate or plywood. It’s a beautiful and durable surface for a kitchen countertop- it resists water, is easy to clean & maintain, is available in a range of colors and styling and is highly affordable. It’s important to keep in mind that laminates are not as heat-resistant as tile and natural stone countertops are. Solid-Surface- These are made of a study, nonporous acrylic material and provide a visually seamless appearance. In addition to being available in a range of patterns and colors, we can install these for you with an integral backsplash and sink. They resist stains, bacteria and water and are a very low-maintenance option for kitchen countertops. 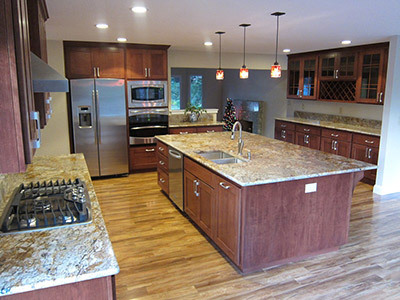 Granite- These are natural stone countertops look beautiful and are very durable. They have heat-resistant properties and resist stains as well as bacteria when they are sealed well. Granite also has a very smooth texture which makes it ideal for homes in which a lot of baking (rolling dough etc) happens. Quartz- This is also a non-porous material that is very durable, stain, bacteria and heat resistant. It does not have to be sealed and is easy to maintain. 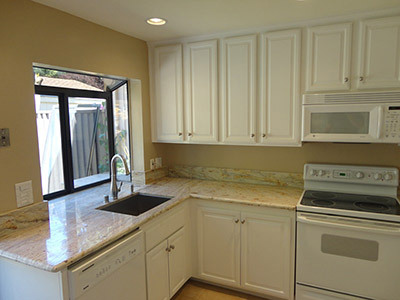 These countertops have very consistent patterns and colors and are easy to clean. Tile- This is another popular material used for countertops in homes across Sacramento, Folsom, Citrus Heights and the surrounding cities. These are available in a range of colors, finishes and styling and are very easy to clean. You can choose from matte or gloss finishes as well as textured and non-textured ones. Many designs are also made to mimic wood, marble and other natural stones. You will have to ensure that the grouting is maintained well. In addition to these you can choose from Butcher Block or fabricated concrete ones. Regardless of what your personal style and choice is, we will help you with designing and installation of different types of kitchen countertops. Bristol Construction is the company that focuses on providing you 100% customer satisfaction in every project we handle. Call us on 916-798-4827. You can use this form to send us an email.